Airpark JFK parking lot near JFK airport. Driving to JFK and parking with Airpark JFK is much easier and less expensive. Offering outdoor long term parking, valet parking, and high levels of customer services. Located approx. 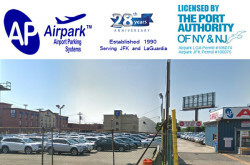 5 minutes (1.3 miles) from the John F. Kennedy Airport. - Shortest Distance to Terminals. Book Online : visit Airpark website for online reservation. 153-44 S Conduit Ave, Jamaica, NY 11434, USA.